Freezing fog is a unique weather phenomenon that we don’t see often, but should be extremely cautious about when we do. Other than the air temperatures, freezing fog is not that different from regular fog. It often forms when it is below freezing air temperatures and a moisture source like a lake or river provides the heat and moisture required to condense into a fog cloud. This fog cloud is full of tiny liquid water droplets in the air that have been supercooled. This moisture in the air stays in liquid form down to about 14 degrees F, even though the freezing point of water is considerably higher than that. For this reason, these supercooled water droplets that make up what is freezing fog will often freeze instantly upon contact to any exposed surface that is below freezing. This includes roads, cars, trees, powerlines and stairs. The same thing actually happens with freezing rain and drizzle. 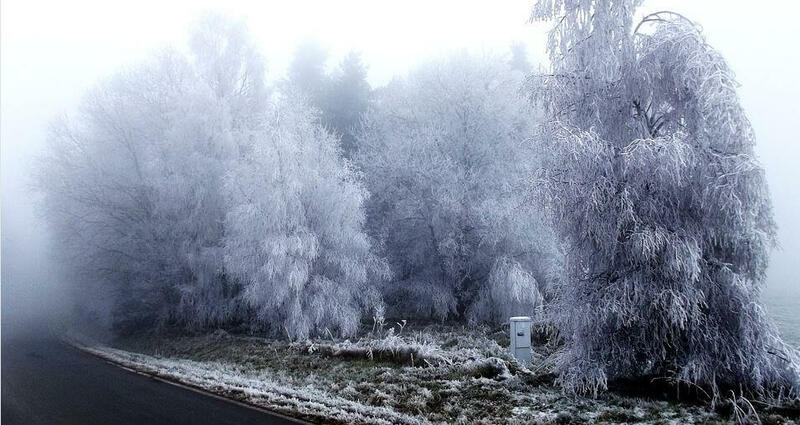 Freezing fog can create a beautiful winter wonderland as it freezes on the trees, grass, and signs. Everything it touches gets coated in ice and the outcome can be both awe inspiring and stunning, at the same time make you speechless about the fear that comes with it. The white ice that forms on the trees and other surfaces is called rime. Freezing fog also provides the conditions required for light pillars (aka ice pillars) to form. These are colorful beams of light emanating in vertical pillars above street lights as they reflect off the ice crystals. Extreme caution should be used when traveling or walking during freezing fog conditions as it’s notorious for creating black ice. Black ice is often defined as a thin coat of ice that is difficult to see. This makes travel very dangerous, both because the ice is hard to see, but also because vehicles have trouble keeping traction on the roadways. It can also cause wide spread power outages as it covers the power lines in what likely won’t be fixed for days. Although they sound like the same thing, there is a difference between freezing and frozen fog. What is frozen fog then? Frozen fog is actually found in much colder climates, most often below -40 degrees F. As humidity gets near 100% and the air temperature drops very low, ice crystals actually form in the air. Of course, then the ice crystals settle onto the surfaces below in a “dusting”. Fun Fact: Freezing fog is referred to as “pogonip” in the Western U.S., which is the Shoshone word that means clouds.